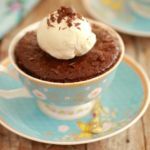 From after-school snack time to anytime indulgence, my three ingredient Nutella recipe will yield you a perfect brownie in a mug. We all know that dessert is the most important meal of the day so let’s get down to business with my Microwave Mug Nutella Brownie. If you’re a chocoholic like me, you appreciate a good chewy brownie. For a brownie this delicious, it’s incredible to learn that the recipe requires just three ingredients and takes just a minute to yield in the microwave. This easy brownie recipe is made with just a few ingredients: a bit of Nutella (store-bought or homemade nutella), a gently-whisked egg, and all-purpose flour. Like most baked goods, whisk your wet ingredients together first then add them to your dry. Once your batter is ready, your homemade brownie is ready for the microwave. Microwaving your brownie in a mug will actually steam any liquid in your batter from the inside out rather than the outside in, meaning you’ll have as chewy of a brownie as its traditionally-baked predecessor. Cooking time given is based on my 1200W Panasonic Inverter Microwave so your timing might vary. I suggest checking it after 1 minute of baking and go from there. If your brownie is overcooked, it will dry out and harden. Your microwave brownie will be done once the top has just firmed. This mug brownie is perfect for after-school snack time, great for sleepovers, and ready any time you want to indulge yourself. Don’t take my word for it, make it and taste for yourself. I know I’m not supposed to have favorites, but this is my favorite mug dessert and soon you’ll know why. Find over 100 other Mug Meals recipes on my Gemma’s Mug Meals Collection Page. Follow Bigger Bolder Baking on Pinterest for more baking ideas! In a large microwavable mug add the Nutella and egg* and whisk together. Add flour and mix until you have a smooth batter. Microwave for roughly 45 seconds - 1 minute. (Cooking time is based on my 1200W Panasonic Inverter Microwave so your timing might vary). Always keep a close eye on your mug while in the microwave so it doesn’t overflow or overcook. Serve with some vanilla ice cream while it’s still warm. They can be mixed up in advance for an even speedier meal. *Replacing Eggs: You can replace the eggs in this recipe by following my Egg Substitutes Chart. All I did differently was use a different brand of chocolate spread and it got all oily and gross. It smelled burnt before it was even cooked. I am sorry this recipe did not suit you, I have no idea why that happened. Many bold bakers have made this recipe successfully, so I cannot explain it. There are a number of things it could be, the spread, the mix of the ingredients and even the mug/cup you use. A wider mug is always best for the microwave because of the way it cooks. WOW, very creative, ill have to give it a try with those subs, thank you for the feedback! Mug cakes always turn out a little spongy though. I find peanut butter is the perfect fix to this. They turn out creamy with just a few spoons of peanut butter into the mix. I’ve been trying to find a substitute ingredient that can make a mug cake creamy but so far have not found one. Wow, that’s a great trick! Thank you! Hope my mum doesn’t kill me for taking so much of her Nutella at once though.